The tortellini are stuffed with three different types of Italian cheeses, mixed with lean ground sirloin, carrots, onions, and even more cheese to top it all off. Not necessarily an artery-friendly recipe, guys. Heed my warning. 2 Lbs of fresh or frozen ricotta-filled tortellini. I buy Buitoni's Three Cheese Tortellini. 1 28-oz can of diced tomatoes. You can edit down the tomatoes if you aren't a huge fan. 1. Preheat the broiler on "High" setting. 2. Prepare the tortellini as al dente, according to package directions. 3. While the pasta is working, place a large skillet over medium-high heat with 2 tablespoons of olive oil. 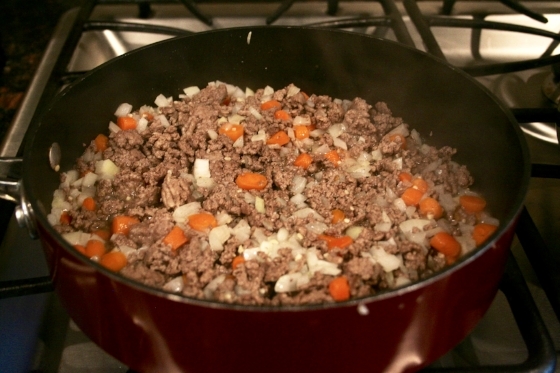 Add the ground sirloin & cook until golden brown, about 6 to 7 minutes. 4. Add the onions, garlic, & carrots to the pan and cook until tender, about 4 to 5 minutes. Add the tomatoes, basil, salt & pepper to the pan and break up the tomatoes with a spatula. 5. Bring the liquid to a bubble and simmer until slightly thickened, about 5 minutes. 6. Add the tortellini to the meat mixture. Mix well. Transfer the mixture to a casserole dish and sprinkle cheese on top. 7. Place under the broiler for about 2 minutes, just until the cheese browns and crisps. Serve hot. This makes for plenty for 2 people, and a hardy portion for 4.